Call for pricing. Vet clinics or vet staff only. 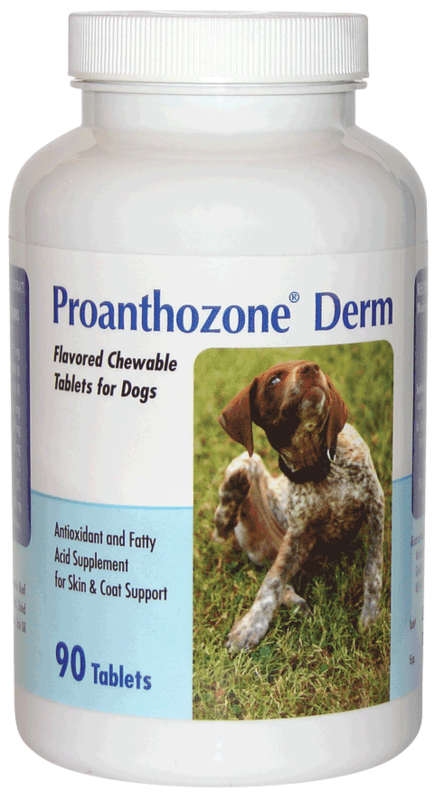 Proanthozone® Derm - Skin and coat support formula for dogs. Vegetarian bacon flavored chewable tablets. For years, veterinarians have used the original Proanthozone® formula in dogs and have achieved positive results. Nonetheless, skin issues have maintained their position at or near the top of the list of reasons why owners take their pets to the veterinarian. The basis of the formula is antioxidants that can help skin health. Omega fatty acids are an important addition to the formula for supporting healthy cell membranes. Proanthozone® Derm includes ingredients for enhanced dermatological use, such as omega-3 and omega-6 fatty acids, as well as Spirulina. It also has plant polyphenols, such as those found in apples, cranberries, pine bark and grape seed extract. The proanthocyanidins found in Proanthozone® Derm are potent, safe antioxidants that support skin and coat health. For more detailed information on the ingredients and how they work, click here. Initial Usage: Double the maintenance usage for the first five days. If needed, the maintenance usage may also be doubled during acute phases.